NETWORK FINALS: ABC’s NBA game adjusted to 1.1. In addition, the AMERICA’S GOT TALENT rerun gained 0.2 in final numbers. CABLE HIGHLIGHTS: ESPN’s COLLEGE BASKETBALL games were at 1.18/0.51/0.43/0.35, and the network’s UFC FIGHT NIGHT was at 0.80. 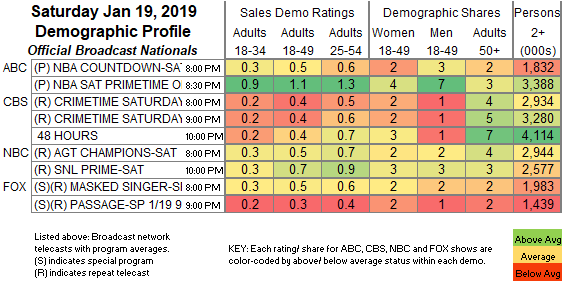 A&E’s LIVE PD jumped two-tenths to 0.69. Adult Swim’s line-up performed as follows: DRAGON BALL at 0.34 and 0.14/423K & 0.14/435K compared to last week’s 0.29 and 0.10/320K & 0.10/321K, BORUTO up 0.04 to 0.26, MY HERO ACADEMIA up 0.02 to 0.23/498K, MOB PSYCHO 100 up 0.01 to 0.22/448K, MEGALBOX up 0.02 to 0.20/411K, JOJO’S BIZARRE ADVENTURE up 0.05 to 0.20, BLACK CLOVER up 0.05 to 0.19/402K, HUNTER X HUNTER up 0.06 to 0.19/389K, NARUTO up 0.05 to 0.18/372K, ATTACK ON TITAN up 0.02 to 0.13/264K, POP TEAM EPIC steady at 0.10/215K, and MOBILE SUIT GUNDAM up 0.01 to 0.10/219K. 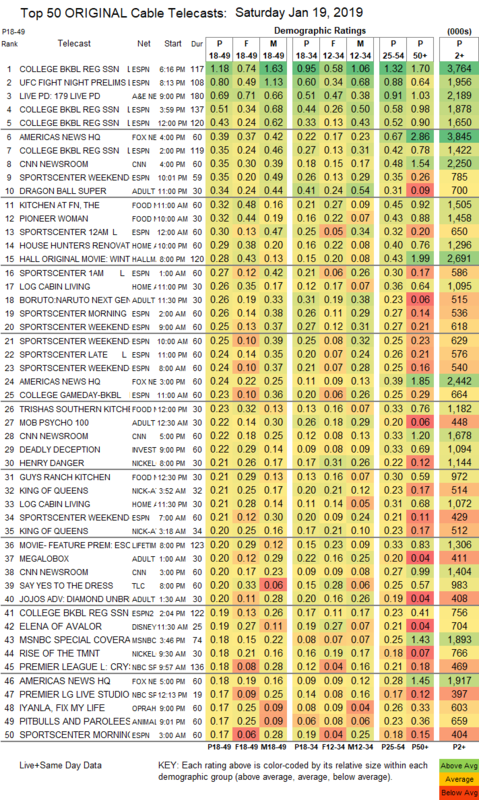 On Food Network, KITCHEN AT FN held at 0.32, PIONEER WOMAN gained 0.05 to 0.32, and TRISHA’S SOUTHERN KITCHEN was down 0.06 to 0.23. HGTV’s HOUSE HUNTER RENOVATION was at 0.29. Hallmark’s movie WINTER LOVE STORY was at 0.28. ID’s DEADLY DECEPTION climbed 0.03 to 0.22. On TLC, SAY YES TO THE DRESS rose 0.04 to 0.20, and FOUR WEDDINGS ticked up to 0.14. On OWN, IYANLA FIX MY LIFE edged up 0.02 to 0.17. BBCAmerica’s DYNASTIES premiered at 0.13, with an AMC simulcast at 0.06. HBO’s BREXIT movie didn’t make the chart with a premiere at 0.05/261K.